Want to buy a mixed-use property? Looking at a multi-residential project? Looking to buy vacant land? We can help! 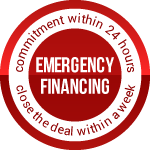 If you have unrealized plans to break new ground and have had difficulty getting financed give us a call today. We’ll provide you with a free consultation to review the particulars of your project and find you a quick and efficient solution to help you make it happen. A mortgage, or mortgage loan, is a legal agreement where a lender offers money to a borrower to purchase real estate in exchange for interest. The loan is secured by the real estate, so if the borrower fails to repay (defaults) the lender can foreclose, selling the property to pay off the loan.